Playtex Diaper Genie Elite Review and Huge Giveaway! 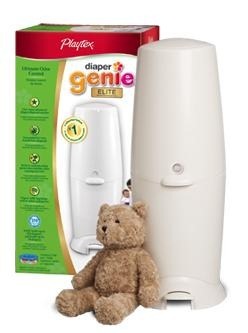 Playtex Diaper Genie Elite is the #1 selling diaper pail brand in protecting against unwanted germs and odors This Diaper Genie has all the requirements moms need when it comes to diaper pails: Easy hands-free disposal with foot pedal, no bending, no twisting and no mess. The five-layer refill bag helps seal in odors and germs and helps prevent odors. The diaper genie was always something I was aware of but never used one for my first child. I always threw each diaper in the garbage and would empty it at the end of each day and it would never smell very pleasant. For my second child I was able review and try the diaper genie and I wondered why I had not been using it all along! It was easy to assemble and even easier to use! It was so convenient to place the dirty diapers in the diaper genie and change it every few days rather then putting it in a garbage pail to smell until I got around to changing it. It was so impressive the way it contained the odor from all of those diapers. Changing the bag was quick and simple to do. My only concern was the cost of the refills and I have not yet determined if the cost is worth the convenience of the diaper genie. I priced the refills at a few stores in my area and they are generally priced the same, $4.99, which is pretty good and not that expensive depending on how many times you use and run out of the refils. The diaper genie itself ranges around $45.99. I plan to continue using the diaper genie to see how long one refill lasts and if it is worth it to buy more refills each time. I truly did enjoy using the diaper genie! Disclosure: All opinions are my own. I received a diaper genie Elite and $100 gift card to Babies R Us for the purpose of this review. No other compensation was received. Thanks to the company for the giveaway prize. 10 of you lucky Just Us Girls CANADIAN readers will get the chance to win your very own Diaper Genie. Winners of the giveaway will be sent your very own Diaper Genie and then will be invited to come back and leave a comment on your thoughts on the product. Once you do you then will be entered in a draw to win a $50 giftcard to Babies R Us.